A power of attorney is a legal document wherein a trusted person is appointed to take care of your financial and legal affairs on your behalf. This may include selling or mortgaging real estate or day-to-day banking affairs. A power of attorney can include general financial and legal affairs, or it can be limited to specific matters. For example, some people need someone to attend the execution of conveyance documents for a property they are buying or selling while they are traveling. Your notary at Sidhu and Associates will also discuss with you the importance of being prepared with an Enduring Power of Attorney in case incapacity arises. This type of power of attorney allows your attorney to be able to represent you if you become incapable. If a person’s mental or physical health is declining, it is important to visit a legal professional right away. If they become too forgetful or incapable, they might lose the capacity to create a power of attorney or other personal planning documents. In the case of declining health, you may be requested to provide a confirmation from your doctor regarding your current capacity. 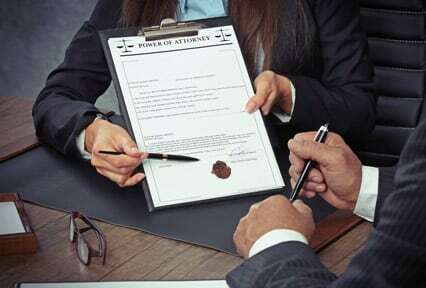 We provide complete services in preparation of powers of attorney, including taking instructions. Please review the attached power of attorney checklist for details of what information the notary may require. Power of attorney places the responsibility of choice with those whom you trust most. Without power of attorney, your family might have to go through the very painful and costly process of committeeship, which is when the court system gets involved to make choices on behalf of the incapable individual. In such a case, the court will try to find the most suitable person to be the individual’s committee. If there is no one suitable, the Public Guardian and Trustee will be appointed. Does the term "Attorney" mean Lawyer? In other jurisdictions (such as in the United States), the term “attorney” normally refers to a lawyer; however, attorney in the legal system of British Columbia denotes an individual appointed under a power of attorney to represent someone else. This person could be a spouse, relative, friend, or a legal professional. They should be someone that you truly trust because the type of authority that you are granting to that person could be misused. The appointee must be an adult and preferably someone who is physically close to you so that they can be ready to help when needed. Most people appoint their spouse with one of their children as an alternate or two of their children, if they don’t have a spouse, or two close friends. What may my attorney do on my behalf? If you have a general power of attorney, they can do anything that you can lawfully do through an agent; however, you can restrict the authority of your attorney to specific matters, like the selling or purchasing of a specific property. Can I appoint more than one person to be my power of attorney? It is best to have a principal attorney as well as an alternate, in case the principal is unable to act on your behalf.